Amazing views, pure luxury, lots of space - it this Cali's best furnished apartment? 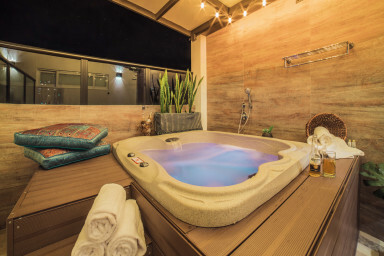 This penthouse includes a big open living room that connects with the kitchen, 2 bedrooms, 3 bathrooms, and a gorgeous terrace with a 6-person jacuzzi. The living room couch doubles as a sofa bed to comfortably fit an adult or two kids. In conclusion, the perfect place for families, groups of friends, executives, etc.